Trusted Reviews has tested a multifunction color laser printer targeted at workgroups. The printer is called Lexmark X544dw and Lexmark claims that it is able to print up to 23 pages per minute in both color and monochrome. Trusted Reviews ends up giving the Lexmark printer a very good score with a “Trusted Reviews Recommended” badge and an overall rating of 9 out 10 points. The X544dw printer scores highest on print quality and prints speeds while it scores a little lower on value for your money and features. If you have a busy small office or workgroup and need a color laser printer this might be your choice. A little downside is that it is quite expensive to print color pages. 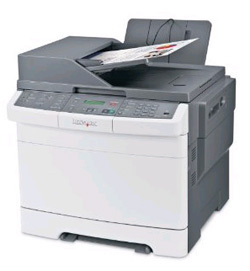 Read the full review of the Lexmark X544dw multifunction color duplex laser printer here.